As always, on the Friday night we headed out in force to our regiment’s favourite pub, the Organ Grinder. It’s approximately a 10 minute walk from the campsite so a perfect little stroll to a cosy but vibrant pub with great beer and gin, which suits most members well! Saturday dawned sunny and warm as has been custom the past few weeks and we got straight to it with drill. We welcomed two new members to our ranks this weekend, Matteo and John. Both of them needed to learn the ropes so once they were kitted out, everyone got stuck into drill. Having not battled properly for a few weeks, it was good for everyone else to improve their skills and get ready for the upcoming day. Especially in these hot conditions, it was important that everyone knew what they were doing and how to ensure they weren’t wasting vital energy. After lunch, having taken on plenty of water, the drums started up again and the adrenaline began to flow as we formed up ready to march off to the battlefield. We’re extremely lucky and privileged to be able to come back to the Queen’s Sconce each year and fight on the earthworks themselves. They are some of the best preserved artillery earthworks in the country from the English Civil Wars so it’s an honour for us to be able to use them as a brilliant backdrop to our battles. As part of our 375th Anniversary celebrations, this year we were recreating part of the first Siege of Bristol that took place in 1643. In this instance we were recreating Thomas Ballard’s regiment managing to break the siege of the Royalist stronghold. 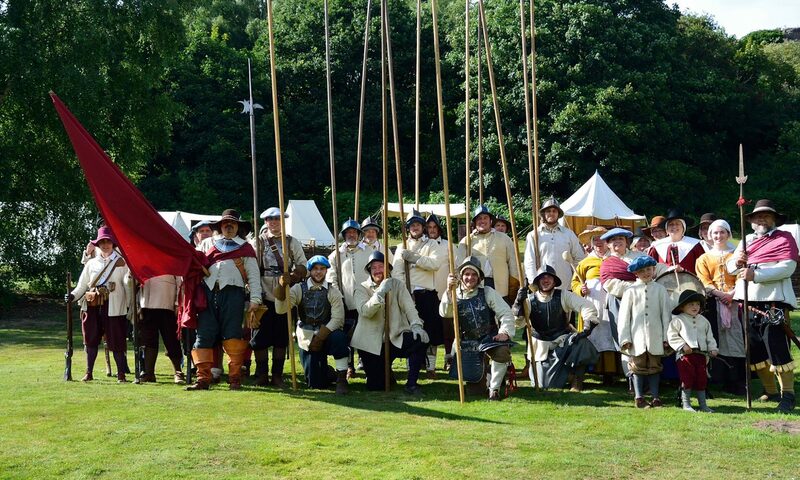 Over the next few years, Newark will feature in our events heavily as it was such an important town at the time of the wars and was sieged a total of 3 times between 1643 and 1646. After the battle was over and we’d all recovered from physical exertion in 3 layers of wool (it’s a little warm…) it was time to get into the party spirit. This time we were celebrating our lovely Musketeer Debbie, who was turning 60 the following week. She still doesn’t look a day over 21 though! It’s birthday season for Newcastle’s as quite a number of other members were celebrating birthdays in the couple of weeks before and after this event. We had a lovely tea party and enjoyed singing around the fire until the early hours. Next morning, with some feeling a little more delicate than others after such a wonderful evening, we were back to it again. Although our drummers went on strike that morning, most of our troops made it out to drill again in the morning and Matteo and John, having done pike the previous day, both gave the musket block a try this time. We ensure that any new members are given opportunities to try more than one thing when they start, to find the perfect role for them on the field. Again, after lunch it was time for another hot battle. After a couple of scrapes and bumps, everyone returned to the campsite hot and exhausted but without major cause for concern. We have to thank our Water Carriers Craig, Charlotte and Suzanne, all led by Linda who do a sterling job in keeping us fighting fit and hydrated on the field. On days like these where temperatures were hovering around 30 degrees, we really couldn’t fight on without you! Finally, with some reluctance it was time to pack up and head home until next time. Luckily, we had another event only a week after to look forward to, so most people weren’t parted for too long. As always, if you think this sounds like the hobby for you, check out our ‘Join Us!’ page to find out how to do just that. All photos by Rusty Aldwinckle unless stated. Next PostNext Upcoming Event: ‘Stafford Under Siege!’ Stafford Castle, Staffordshire – 9th September 2018.